Melanomas in both humans and dogs are a common and highly aggressive cancer. Similarly, in both dogs and people, these cancers are genetically complex and can occur with or without an association with ultraviolet light. These cancers, irrespective of their genetic origin, are aggressive, frequently metastasize, and there are limited effective treatments for advanced cancers. Therefore, there is a critical need to identify novel targets for anti-melanoma therapy in both humans and dogs. If successful, this study data will lay the foundation for development of novel therapeutics to treat melanomas in both dogs and people and to advance this new and exciting field of cancer therapy that targets oncogenic IncRNAs. Owner will receive monetary incentive of $200 for study participation. Food allergies are relatively frequent in dogs. The diagnosis of food allergy is currently based on a long-lasting elimination diet (ED) trial that may last up to 12 weeks. Such a tedious and long-lasting process is susceptible to complications that may result in a failure of obtaining the correct diagnosis. The purpose of this study is to demonstrate that the duration of the elimination diet trial for diagnosis of food allergy can be shorter than the traditional 8-12 weeks when a short course of steroids is used to deactivate the ongoing allergic immune response. As well as to assess the sensitivity and specificity of two different serological tests and of a prick test for diagnosis of a food allergy. NC State University College of Veterinary Medicine is looking for dogs with lymphoma to determine if Cancer Anorexia Cachexia Syndrome (CACS), a common problem for human cancer patients, also occurs in dogs. Developing this new understanding could potentially help us improve affected dog’s quality of life and ultimately survival. Lymphoma group dogs must be newly diagnoses lymphoma with no prior treatment, can not have any concurrent diseases, and must have a completed physical examination and complete blood count and chemistry panel. Control group dogs must be healthy with no concurrent diseases, must not be on any medication other than preventative medications, and must have had a complete physical examination within the past year. NC State University College of Veterinary Medicine is looking for dogs to participate in a study investigating canine IncRNA as a biomarker and novel therapeutic target against canine diffuse large B-cell lymphoma. This study aims to develop non-invasive screening methods to diagnose this aggressive cancer in its early stages as well as to identify novel therapies to treat this cancer. A successful study will open new lines of research improving the detection and treatment of a common and devastating cancer of dogs. A one-time blood sample collection at NC State University College of Veterinary Medicine. Control Group Dogs: Must be normal healthy dogs with no active internal diseases or history of cancer. Clinical dogs with lymphoma: Dogs with any type of lymphoma (B-cell is ideal) and be active disease before treatment has been started or a disease that is no longer in remission. – Your dog must not leave the range of the ‘Gateway’ (approximately 300 yards) longer than 12-15 hours per day. Mitral valve degeneration is the most common cause of heart disease in the dog. It is particularly common in small breed dogs including Cavalier King Charles Spaniels, Yorkshire Terriers, Miniature Poodles, Dachshunds and small mixed breed dogs. Although some dogs live comfortably with the disease, many affected dogs die of congestive heart failure. Mitral valve degeneration is known to be an inherited disease, at least in some breeds, although the causative mutation(s) have not been identified. In this study we hope to identify genetic variants that lead to the development of mitral valve disease in the dog. Dogs can come to NCSU for a diagnosis and collection of a blood sample. Small breed older dogs with a presumed or confirmed diagnosis of mitral valve endocardiosis (degenerative valve disease). The cost of the examination and echocardiogram will be covered by the funding agency, Morris Animal Foundation. Rhodesian Ridgebacks suffer from an inherited electrical issue with their heart. It appears to develop between 4 and 36 months. Some dogs do die of the disease, but others outgrow it. We are now studying the disease to determine at what age they are at the highest risk of developing an arrhythmia. Dogs must be between 4 and 6 months of age. Does your DOG or CAT have a urinary tract infection? We need participants with an active urinary tract infection to participate in a study evaluating novel kidney biomarkers. Cats or dogs with a positive urine culture will be evaluated and receive comprehensive blood work and urinalysis free of charge at monthly intervals for 3 months. Does your DOG have proteinuria? We need dogs with kidney disease that have persistent proteinuria (UPC >1.0) that is being managed with an angiotensin-converting enzyme inhibitor (ACEi) and/or and angiotensin receptor blocker (ARB). Dogs already receiving ACEi’s or ARB’s are also eligible. Participants will be monitored for 6 months. and will receive physical exams and diagnostics free of charge. The purpose is to evaluate these dogs for aldosterone escape. We need spayed female dogs that have been diagnosed with urethral sphincter mechanism incompetence and have failed standard therapy (i.e., Proin, DES). Eligible participants will have autologous progenitor muscle cells injected surgically in an attempt to restore the urethral sphincter function. Dogs with anatomical abnormalities that cause incontinence are not eligible. Enrolled participants will be monitored for 2 years and receive all study procedures free of charge. Does your CAT have Chronic Kidney Disease? We need cats 8 years or older with chronic kidney disease to participate in a research study evaluating the prevalence of gastric acidity. Your cat will be administered orally (like a pill) a pH capsule, that will provide continuous pH measurements for 48 hours, and eventually be excreted in the feces. A receiver device kept close to the cat will record the measurements. Cats will receive a physical evaluation and comprehensive blood work and urinalysis free of charge for their participation. Cats that have other concurrent diseases and or that are being given an acid suppressant medication or an intestinal phosphorus binder (within 7 days of enrollment) are ineligible for the study. Heart disease in the Boxer is most commonly a disease of the heart muscle that leads to electrical disturbances. The disease is inherited but some dogs are more severely affected than others. It is possible that changes in thyroid level may impact if a dog will have a mild or severe form of the disease. Understanding the role of thyroid in the severity of disease will greatly improve the ability to manage this common and sometimes fatal heart disease. Owners will be asked to bring their Boxer dogs that are believed to have heart disease in for genetic test, thyroid level, TSH test, an echocardiogram and 24 hour Holter monitor to determine the level of disease. Adult boxer dogs with a history of heart disease. Heart disease symptoms might include periods of collapse, evidence of abnormal heart beats on an ECG or Holter, or evidence of heart failure. Boxers with other significant systemic health problems (cancer). All aspects of this study are paid for by a grant from the American Kennel Club Canine Health Foundation. Any medications are not covered. The objectives of this pilot study are to determine differences in bacterial populations and quantify the Lactobacillus component of the feces of untreated epileptic and control dogs, and to determine the effect of antiepileptic medication on Lactobacillus growth rates. Molecular genetic and bacterial culture techniques will be used. This study will provide preliminary information on the role of gastrointestinal tract bacteria in canine epilepsy. This Information has the potential to further our understanding of epilepsy and drug resistance in dogs, and ultimately lead to more successful management of the disorder. We are recruiting dogs that have been diagnosed with epilepsy but are not currently receiving anti-seizure medication, and that live in a household with another dog that is not epileptic. Owners of dogs enrolled in the study will be instructed to collect a fresh stool sample from their dogs to ship to the investigators. Owners will also be asked to complete a brief questionnaire related to their dog’s environment, diet and health. This study is funded by a grant from the the AKC-Canine Health Foundation. After a successful phase I safety study, the goal of this new research project is to continue studying and refining Immunolight Therapy, an innovative approach to cancer treatment. We work with pet owners and primary care veterinarians to help determine eligibility, and to advise on any testing that may be needed before coming to NC State. The study is being conducted by doctors in the Radiation Oncology section. This study is financially supported by Immunolight, LLC., and NC State CVM. Enrolling dogs with Lymphoma: For dogs with newly diagnosed lymphoma, or if chemotherapy is no longer working. – Dogs with tumors of the skin, toes, mouth, perineum, and other sites MAY be eligible. – Most internal tumors will NOT be eligible. – Dogs having received prior treatment for their tumor will be considered, if that prior treatment is no longer helping. – Dogs may not receive other treatments for their tumor during the study. Glaucoma is a painful, blinding disease in dogs which currently does not have a cure. Very little is known regarding the cause of glaucoma and the factors that lead to progression of the disease. To evaluate the role that inflammatory mediators may play in the development of canine glaucoma, cytokine levels present in aqueous humor of dogs that will develop glaucoma will be compared to those of dogs that will not develop glaucoma. A small sample of aqueous humor will be obtained from the eye that has not yet developed glaucoma under general anesthesia. Dogs that require enucleation under general anesthesia to remove an eye that is blind and painful due to glaucoma. Cases in which the second eye (not yet affected with glaucoma) has been treated with topical steroids or topical prostaglandin analogues. Patients that participate in the clinical study will receive 5 free follow up exams to monitor the onset of glaucoma in the eye. *** ENROLLMENT IS CLOSED *** This blinded, randomized trial compares the effect of electromagnetic field delivered by an Assisi coil on the post-operative recovery of 16 dogs that have suffered an acute intervertebral disc herniation. Dogs with severe disc herniations (see below for inclusion criteria) will be randomized to an active or placebo coil at time of diagnosis, and treatment initiated immediately. Dogs will undergo surgery as usual. Dogs will remain in hospital for 1 week post operatively and then return for rechecks at 2, 4 and 6 weeks. Their ability to walk and their pain level will be assessed. The injury must be severe causing acute onset of paralysis with loss of pain perception (i.e. clinically complete lesions) for which they were treated surgically as per routine hospital protocol. The study will cover: $1,200 towards diagnosis and surgery as well as all hospitalization for the week after surgery. It will not cover the cost of complications in the post- operative period that are not related to use of the Assisi coil (e.g. UTI) Clients will be responsible for the initial evaluation and diagnosis if dogs does not fit in criteria. *** ENROLLMENT IS CLOSED *** Thoracolumbar intervertebral disc herniations are a common cause of paralysis in dogs. Standard treatment of non-ambulatory animals is surgical decompression of the spinal cord followed by post-operative care that commonly relies on confinement for 2 – 4 weeks to prevent re-injury. There is a body of research that suggests early rehabilitation is beneficial following spinal cord injury. The purpose of this study is to establish whether early post-operative rehabilitation increases the speed and level of recovery without causing adverse events. This is a randomized, controlled, blinded, prospective clinical trial. Dogs will be randomized to either an intensive or a conservative rehabilitation program (such as is currently performed by owners at home using passive range of motion exercises, limited sling walking and confinement). Dogs from both groups will be hospitalized for 14 days post-operatively to receive their rehabilitation therapy. Neurological examinations will be performed at time of presentation and daily for the first 14 days. Dogs will be videotaped walking on a treadmill and on a flat non-slip surface to score gait. This will be performed on days 1, 3, 7 and 14 and repeated 4 weeks later to determine final outcome. Clients will be responsible for the initial evaluation, diagnosis, and surgery. The study will cover the cost of 2 weeks of hospitalization, rehabilitation and the recheck visit. *** ENROLLMENT IS CLOSED *** In this study, we are investigating why some dogs with chronic spinal cord injuries respond to medication to improve walking ability while others do not. If you are interested in more information and/or think you have a dog that may qualify, continue reading below. Acute spinal cord injuries are a common problem in dogs, and some dogs fail to recover and are left permanently paralyzed and incontinent. In prior clinical trials, we have shown that chronically paralyzed dogs have extremely variable responses to the potassium channel-blocking drug, 4-aminopyridine (4-AP). Some treated dogs improve to the point of walking while others show no response despite having suffered from very similar initial injuries. The aim of this trial is to identify the factors that predict response to this therapy in dogs with incomplete recovery following acute spinal cord injuries allowing optimization of individual therapy regimens. Procedures: We will perform a neurologic examination, gait evaluation, sensory threshold testing, electrodiagnostic testing and MRI, both before and after treatment with 4-AP (except for MRI which is only performed once). Study duration is 2 days. On day 1, your dog will be admitted to the hospital for baseline evaluation of the above procedures including electrophysiologic assessment (under sedation) and MRI (under general anesthesia). The following day, your dog will receive 4-AP orally after which the same neurologic and electrophysiologic assessments will be repeated. -Dogs with a history of severe thoracolumbar spinal cord injury at least 3 months prior followed by an incomplete recovery. The injury must be severe enough to cause persistent loss of pain perception in the hind feet. Dogs with seizure disorders will be excluded because 4-AP can exacerbate seizures. NCSU will cover costs of hospitalization, all procedures and medication administered during the study. Chiari-like malformations (CM) are developmental abnormalities of the skull that result in compression of the cerebellum and brainstem. The result of this crowding of the brain within the skull is abnormal accumulation of cerebrospinal fluid in the spinal cord, syringomyelia (SM), which results in chronic pain. 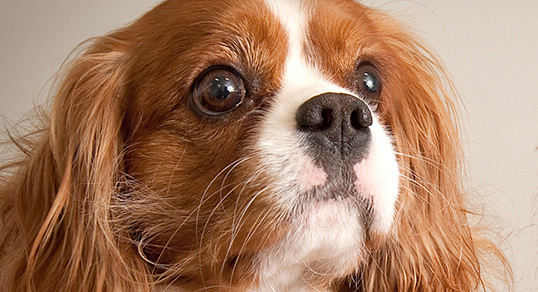 This condition is extremely common in the Cavalier King Charles Spaniel breed and many dogs suffer from this pain syndrome. We aim to perform genetic analysis on affected and unaffected dogs with the intent to develop genetic tests that will aid breeders in breeding away from the problem. Owners will be asked to submit digital MR images and DNA sample from their dogs and to complete a health questionnaire. Ideally MRIs will have been performed at 2.5 years of age or older, but we will accept studies performed at a younger age. We will be able to schedule MRIs at a reduced cost at NC State. This article has been originally published in North Carolina State.